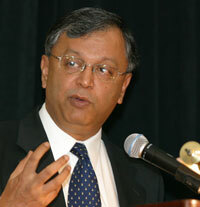 Madhav Chavan ambassador of School Choice Campaign: Fund Students, Not Schools! Dr. Madhav Chavan is one of the founders and the Director of Programs of Pratham, an organization that has been working for universalization of elementary education in India since 1994. A Chemist by training, he got his doctorate in Chemistry from the Ohio State University in 1984. After a stint as a post-doctoral fellow and a Visiting Assistant Professor at the University of Houston he returned to India and was appointed Reader in Physical Chemistry at the University Department of Chemical Technology, University of Mumbai in 1987. In 1989 he got involved in the adult literacy work in the slums of Mumbai and founded the Committee of Resource Organization (CORO) for Literacy and began to move away from Chemistry. He was involved in the social organization aspects of the Integrated Waste Management Project of the Department of Science and Technology, Government of India between 1992-94. Dr. Chavan has been a creative contributor in the field of adult literacy, elementary education, and the development sector in general. His contributions range from scripting and presenting a unique prime-time Mumbai Doordarshan serial “Akshardhara” (1990-91) on adult literacy, penning the Government of Maharashtra's theme song for girls' education, and the most recent ‘learning to read' technique to the innovation of replicable and scalable programs for education. Dr. Chavan has been a visiting fellow to the Chinese Academy of Sciences (1986), Queensland University of Technology (1999) and has lectured on issues in education at various universities in the United States.